If you have been following me for awhile, you know I love all things Almond Joy flavored. 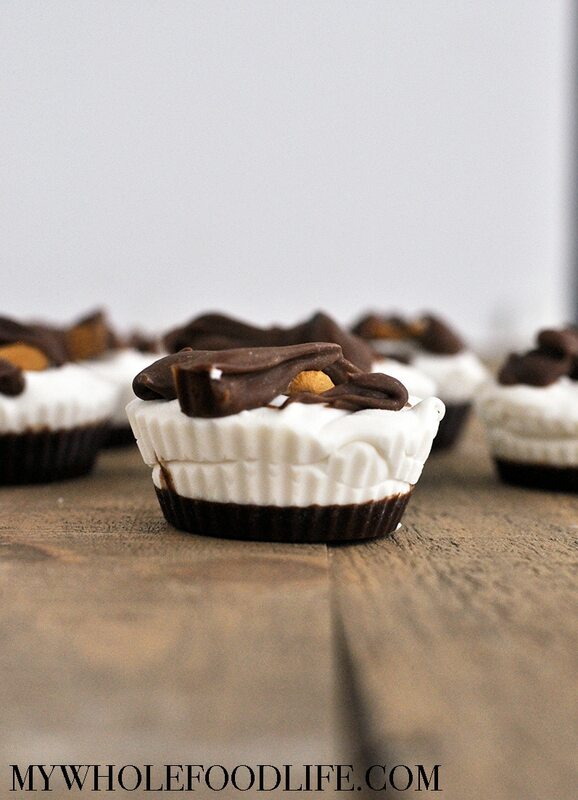 These Easy Almond Joy Candy Cups are my latest creation. I know you are going to love them! There are a few things that make this recipe great. They are vegan, gluten free and paleo approved. The contain ZERO refined sugar, and there is no baking required! Only 5 simple ingredients! I have such a sweet tooth, so I am always thinking of new ways to enjoy sweets in a better way. Since these contain a good amount of fat, and they are super rich, you don’t need much to satisfy. I made mine in standard sized muffin pans and got 6, but you can do a bite size up if you like too! We shot a short video for this recipe if you need a visual. You can view it below. To see more of my videos, you can follow my You Tube channel. Whip up these Almond Joy Candy Cups in no time at all. Only 5 ingredient, vegan, gluten free and ZERO refined sugar! In a small mixing bowl , mix the ingredients for the bottom chocolate layer. Once mixed, pour a little into the bottom of each lined muffin cup. Place the chocolate in the freezer while you make the middle layer. In a food processor , mix all the ingredients for the coconut layer. Pour into each muffin cup on top of the hardened chocolate layer. Put a few whole almonds on top of each cup. Place in the freezer while you make the top chocolate layer. Mix all 3 ingredients in a small mixing bowl . Drizzle over the top. Place back in the fridge to set. About 10 minutes. I used standard sized muffin cups and got 6. Keep these stored in the freezer. They should last a few months. Enjoy! These look sooo good! I have a sweet tooth that doesn't end, too. Hi Melissa would you please tell me about coconut butter? I've made my own using coconut flake in my new blender. After making it I put it in the refrigerator. It turned very solid. I took it out 12 hours ago and it is still pretty solid. Is that's normal? If I melt it will the consistency be off for this recipe? Hi Shelly, Yes that happens when you put it in the fridge. I keep mine in the pantry and it doesn't get as hard. You can place the jar in a pot of warm water to soften it. I can't imagine these lasting a few months. In our house, they'd be all gone in a few minutes!! Yum!